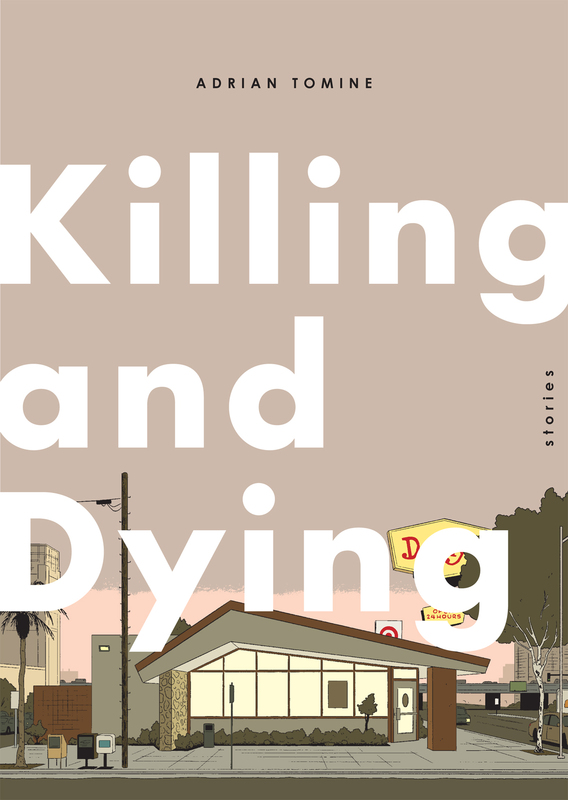 Adrian Tomine’s collection of short fiction Killing and Dying is one of the finest examples of comics-as-literature published to date: these six exceptional stories should be anthologized with the best from writers like George Saunders, Donald Antrim, and James Salter. Each piece in Killing and Dying should be shortlisted for fiction awards, and some, like “Amber Sweet,” should win. The fact that Killing and Dying is exquisitely illustrated feels like a bonus paired with such beautiful prose, but to see the book as “literature with pictures” would be to sell the collection short: Tomine is not only is a brilliant artist but he works astutely with the medium of comics, conveying ideas on a conceptual level that could only work in this format. Killing and Dying is a feat of artistic precision and versatility. Tomine’s line work is confident and meticulous, deftly capable of rendering simplicity in a busy cityscape or the resonant minutiae of domesticity. But somehow his panels don’t feel cluttered or overwhelming; they hum with vivacity and familiarity and possess a sort of deconstructed tenderness. Tomine is strangely reductive in his compositions, as if trying to pare the universe down to only the essentials in a single still image. His portraiture sings with a similar perfection: in just a few lines he can render hope, pride and rejection on a character’s face, oftentimes all at once. Killing and Dying is the epitome of authorial control: each scene is exactly as Tomine intends, with no complex emotion left unexpressed. Further, in an ambitious and wildly successful twist, Tomine dons the formal mantle of those artists that influenced him and stylistically emulates their work in some stories. “Hortisculpture,” about an ambitious gardener-turned-artist, buzzes with references to Charles Schultz and the Peanuts gang. Tomine’s story is built from black and white “daily” strips that each end with a punch line after exactly four frames, expanding every seventh strip into full-color, full-page chapter that looks like an old Sunday comic. The somewhat crudely drawn “Intruders” is a narrative shift for Tomine, but its story is reminiscent of Yoshihiro Tatsumi’s strange manga about seedy, social misfits. “Translated, from the Japanese” abandons framed dialogue-based comics altogether and reads like an illustrated, hand-written memoir. These stories, nestled among more straightforward prose like “Killing and Dying” and “Amber Sweet,” provide the collection an added layer of brilliance. 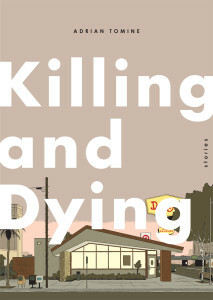 The title story “Killing and Dying” achieves a similar emotional range, but remains somewhat of an outlier for feeling ever-so-slightly overwrought. A stuttering, shy teenage girl mentions to her mother that she’d like to be a stand-up comedian. “M-M-Maybe there’s a class or something,” she says, hugging her knees, her face turned away from the reader. She’s teeming with cringe, and even though her father disapproves (saying “I’m opposed to embarrassment”), we as readers still have to endure every family fight, bedroom spat, and awkward comedy routine. “Killing and Dying” appears to be a story about teenage Jesse searching for self-confidence and identity as she drifts closer towards adulthood, and about parents who need to continue to grow along with their kids, but Tomine fogs that up by revealing the mother has cancer. Suddenly the story is about loss and trying to build new connections in lieu of that absence; it’s sad, but also feels like a story trying to be one thing too many. Still, as a whole, Killing and Dying is nothing short of a triumph. Tomine’s prose will appeal to literary stalwarts while the precision of his artwork will leave viewers in awe of his ability to balance confidence and humility.